Proverbs 31: Part 4&5 Charm is deceptive. ..
Good evening y’all. Today we are studying proverbs 31: 23 – 31. I’m focusing on verse 25 and 30 today. “She is clothed with strength and dignity, and she laughs without fear of the future” (NLT). Here is a woman who is strong and has learnt to not worry about the future but rather enjoy each day as it comes. I ask why is she laughing at the future? Perhaps it’s because she knows that God is able to provide for the future and she doesn’t need to fret about it. I found the commentary below regards this verse. “What does that word “dignity” mean? It refers to the fact that she is elevated above common things. She is elevated about trivial things. Her life is not all about what doesn’t matter. She has true class, true virtue. She has godly character. She is spiritually strong and she has elevated herself to the nobler issues. And she has the power of true character and its expressed in the fact that she smiles at the future. She has no fear. Why? Because she knows her life is right with God and that secures His blessing in the future. You shouldn’t fear the future. You shouldn’t worry about the future. If your life is right with God the promise of God is unfolding blessing, isn’t it? She knows in whom she trusts. She knows her life is right. She is faithful. She is pure. And therefore she can delight in what is ahead. Those who fear the future are those who experience guilt in the present. If you’re overburdened by the weight of your own sin and unfaithfulness, you have every reason to fear the future because the Bible promises chastening. This woman, because of the virtue of her life, can smile at the future and know the promise of God for blessing” (John MacArthur, Proverbs 31, http://www.gty.org.uk/resources/sermons/80-168/the-proverbs-31-woman). 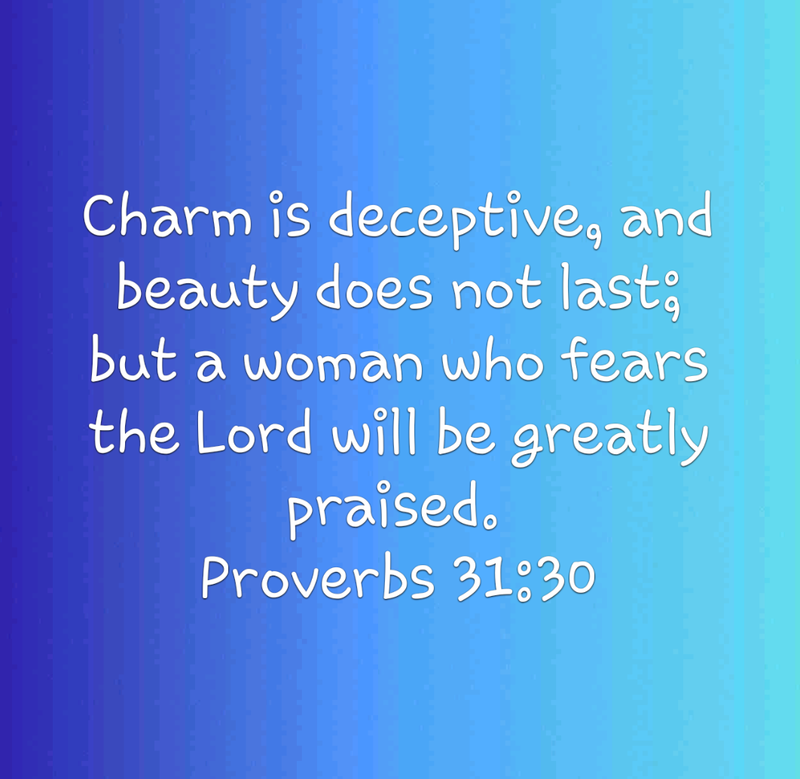 “Charm is deceptive, and beauty does not last; but a woman who fears the lord will be greatly praised” (NLT). This is very relevant especially for me as a single woman. Society tells it’s all about the physical packaging but God says it’s all about the inward packaging. I remember one experience I had about packaging. I went to the shops to get some strawberries. They looked so sumptuous; well packaged and all. I bought a pack and only for me to tuck into it and realise it was rotten with maggots inside. Imagine my disgust at this. I couldn’t believe it because it looked fresh and good in the package, plus it was still within the use by date. I returned it to the shop and they refunded me and compensated me for my distress. Needless to say, that put me off strawberries for a long while. Its the same with us. You can package yourself well with all the makeup; have all the curves in the right places; and even attempt plastic surgery to fix the bits you think are not perfect but the real question is when people look deeper what would they find? No amount of plastic surgery or make up can change what is on the inside of you. Only God can change you from the inside out. That’s why we are told a woman who fears God is to be praised. “Don’t be concerned about the outward beauty of fancy hairstyles, expensive jewelry, or beautiful clothes. You should clothe yourselves instead with the beauty that comes from within, the unfading beauty of a gentle and quiet spirit, which is so precious to God. This is how the holy women of old made themselves beautiful. They put their trust in God and accepted the authority of their husbands” (NLT). Thanks for joining today. Pls feel free to share your thoughts on chapter. 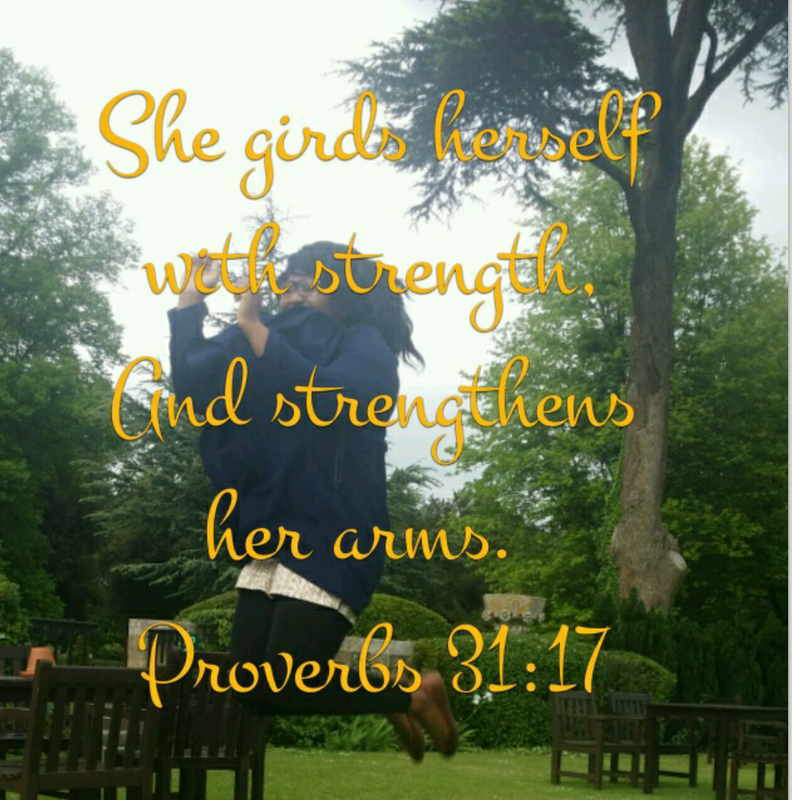 Proverbs 31: Part 2&3 The Balanced Woman…. Good evening y’all. Apologies i didn’t get round to posting yesterdays blog on verses 15 -18. I am going to do a combined blog for yesterday and today, covering verses 15 – 22. “She gets up before dawn to prepare breakfast for her household and plan the day’s work for her servant girls” (NLT). She does whatever needs to be done to provide for her family; to make sure they are well taken care of, even if it means waking up way early to get the ball rolling. She puts her families comfort ahead of hers. “She considers a field and buys it; From her profits she plants a vineyard” (NKJV). She is an entrepreneur. She is not impulsive in her decisions but she thinks it through. NKJV says she “considers…”, that is, she thinks it through, weighs all the pros and cons before buying the land. She is good at negotiating and investing. She strengthens herself. She is not a lazy woman. She prepares her mind for work. She does all of this out of love for her family. “She perceives that her merchandise is good, And her lamp does not go out by night” (NKJV). She senses that what she’s doing is productive and can see the effect it has on her family. This motivates her to continue to work even till late at night. I also thought from the later part of the verse where it says “her lamp doesn’t go out”, that this could mean she knows how to juggle all the tasks she has to do, so that she doesn’t burn out physically. Again, showing the creative and hardworking side of her. She is always ready to help the poor and needy. “She has no fear of winter for her household, for everyone has warm clothes” (NLT). She makes sure her family is prepared in and out of season. Nothing catches her by surprise. She plans in advance. “She makes tapestry for herself; Her clothing is fine linen and purple” (NKJV). She takes good care of herself. In the midst of the busyness around her, she still makes time out to make sure she is well clothed including her family and home. I pray God gives us the grace and strength to be this woman in our daily lives. Thanks for joining today. Pls feel free to leave your thots on chapter.